The worst loss in program history still sits in the minds and hearts of Miami Hurricanes’ fans, and it came at the hands of the Clemson Tigers. No. 7-ranked Miami has a chance for vindication on Saturday, when it plays No. 1 Clemson in the ACC Championship Game, with a conference title and a spot in the College Football Playoff on the line. Win or lose on Saturday, keep in mind that the Hurricanes have come a long way since that Saturday afternoon on Oct. 24, 2015, and that can’t be forgotten. It has been just over two years since that blowout at what was then called Sun Life Stadium. Over that 770-day span, UM fired former head coach Al Golden, hired Mark Richt, won its first bowl game in more than a decade, beat rival Florida State for the first time in eight seasons and won the Coastal Division for the first time in program history. On top of all that, Miami still has a chance to win both a conference championship and make it to the College Football Playoff. The Canes have a tough test ahead of them in playing the Tigers, but regardless of the result of the game, you must understand this: this season has already been a success. Coming into their 2017 campaign, Miami’s primary goal was to win the Coastal Division. They did it. The Hurricanes reached their goal. You can rest easy knowing that no matter what the score comes out to be when the last second ticks off the clock, Miami did what it set out to do in 2017. And for a team trying to make its way back to the top, that is monumental. Now, it is all about seeing just how far the Canes can further exceed expectations. Going into Saturday’s ACC face-off, odds makers show Clemson as the clear favorite. It’s OK. Miami has dealt with adversity before and will continue to in its quest to bring championships back to Coral Gables. The Hurricanes can handle it. While the Hurricanes clearly want to win a ring this season, 2017 is only the beginning. It is only the second year in the Richt Era. The future is bright. 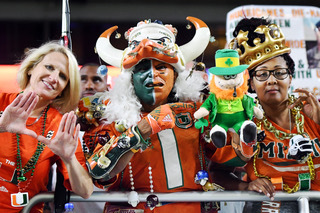 UM has recaptured the hearts of the city and has given people a reason to believe in its football team again. Regardless of what is happening in and around the city, Miami has given fans something to look forward to week in and week out, and that can’t be forgotten. And while people may debate whether “the U is back,” there is zero doubt that the South Florida swag most definitely is. Enjoy the excitement Canes fans. Let it soak in. Celebrate what Richt and his team have brought back to the city and cheer them on like only you can.